Myeloma or multiple myeloma (also called Kahler disease), not to be confused with melanoma (skin cancer), is an orphan and rare, chronic, incurable blood cancer. Leukemia and lymphoma are also blood cancers originating in the bone marrow. These blood cancers (including myeloma) are often managed under the same umbrella/department within hospitals as they correlate with each other because of the unrestrained growth of the cells (characteristic of most active cancers) and parallel functions which they possess. To their difference, leukemia and lymphoma are in general hopefully normally curable. Leukemia, lymphoma and myeloma affect approximately one million people a year in the United States. Myeloma is a form of cancer that begins in the blood’s plasma cells (or plasmocytes) which are made in the bone marrow (the soft, inner part of some bones).Plasma cell share a type of white blood cell (B lymphocyte) that are to produce antibodies (e.g., monoclonal proteins or M-proteins) and which purpose is actually to fight infections, hence are part/compose the immune system. Multiple myeloma is the disease that alters the sense/goal of these plasma cells, which no longer fight infection but rather (i) mutate (before even additional other mutations) and (ii) cause the generation of an excess of abnormal plasma cells (myeloma cells by then), which in turn form tumors in multiple locations throughout the human body, especially in the bone marrow. These tumors begin to overcrowd the bone marrow (they “colonize” their environment) and also prevent normal reproduction of healthy blood cells. Although there is no known cure to this day, multiple myeloma is sometimes treatable and thanks to new drugs and increasing research in the field, outcomes are constantly improving. Male, African-Americans, Caucasians of Ashkenazy origins and Native Pacific Islanders (Hawaiians) have the highest reported incidence of this disease in the United States, and Asians the lowest. Results of a recent study found the incidence of myeloma to be 9.5 cases per 100,000 African-Americans and 4.1 cases per 100,000 Caucasian Americans. Among African-Americans, myeloma is one of the top 10 leading causes of cancer death. 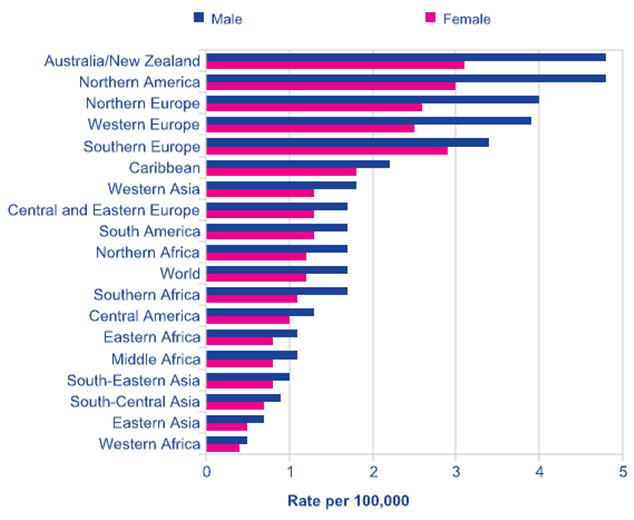 Source: Cancer Research UK, 2008 estimates. 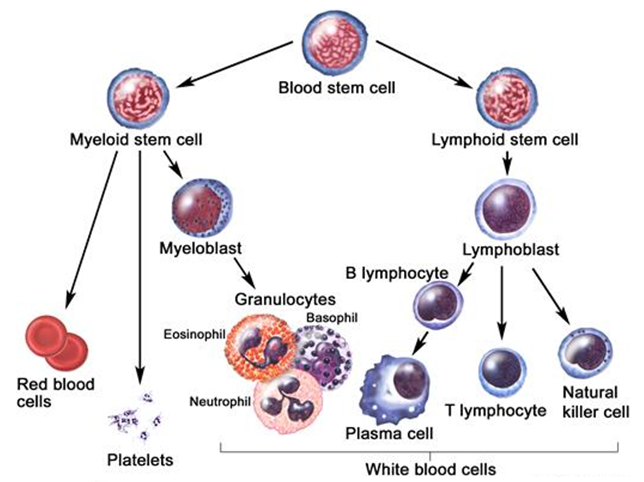 OriginsPlasma cells are the final product in the life cycle of B lymphocytes/cells, a type of white blood cell that originates in the bone marrow and helps constitute the immune system.When a person develops an infection, B cells normally respond by rapidly maturing into plasma cells. These cells produce antibodies called immunoglobulins that help destroy infectious agents.Plasma cells are usually found in the tonsils, lymph nodes, abdomen, and bone marrow. 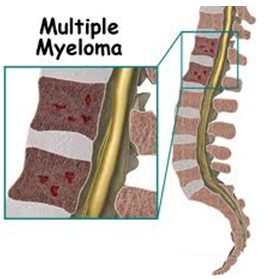 Multiple myeloma begins and is characterized when a normal plasma cell is (i) transformed into a malignant cell, and (ii) begins to grow and spread uncontrollably in your bone marrow – the soft, blood-producing tissue that fills in the center of most of your bones –. This transformation results from genetic mutations – changes in a cell’s DNA – which can take place when plasma cells divide.The malignant cell potentially created through this process then begins producing identical copies of itself, called clones, which bind to stromal cells, a type of connective tissue cell. 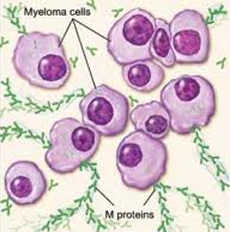 Once bound to the bone marrow, myeloma cells multiply. Because abnormal cancerous cells don’t mature and die as normal cells do, they accumulate, eventually overwhelming the production of healthy cells. In healthy bone marrow, less than 5% of the cells are plasma cells. But in people with multiple myeloma, more than 10% of the cells may be plasma cells. 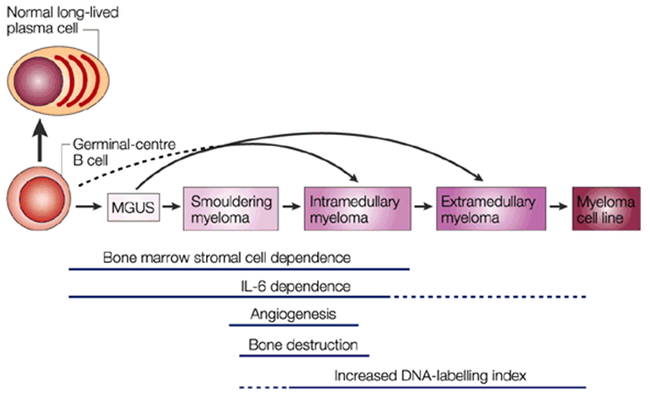 Because myeloma cells in early-stage disease, may circulate in low numbers in your peripheral blood, because it appears that the myeloma cells suppress the ability of the normal immune cells to perform their normal immuno-surveillance function against cancer cells (including MM),and furthermore because the bone marrow appears to protect the myeloma cells from the activity of the immune system, they can (i) not be identified hence destroyed by one’s functioning immune system, (ii) not be traceable by the most advanced blood tests (the plasmocytes might not be in sufficient number to produce the peak of protein level that highlights their activity) or images and machines (PET/CT scans, etc.) currently, and (iii) populate bone marrow in other parts of your body, even far from where they began. That’s why the disease is called multiple myeloma. Uncontrolled plasma cell growth can damage bones and surrounding tissue. It can also interfere with your immune system’s ability to fight infections by inhibiting your body’s production of normal antibodies. 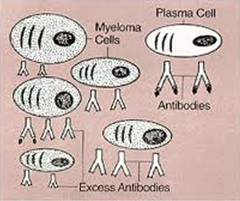 Normal plasma cells produce one of five types of antibodies or immunoglobulins – IgG, IgA, IgM, IgE, or IgD -. Each of these proteins has a slightly different function in the body. Myeloma cells also produce these immunoglobulins, but myeloma cells make them in excessive amounts (similarly to its own production). As a consequence, it is possible to quantitatively determine that about half of myeloma patients produce very high levels of IgG, 20% produce high levels of IgA, and a few patients produce excessive levels of IgD or IgE. Most people with myeloma also have protein in their urine, a condition called Bence-Jones proteinuria. 1% of myeloma patients have a form of the disease called non-secretory myeloma in which there is no protein in their blood or urine, but malignant plasma cells are present in the bone marrow. Over time, as myeloma cells divide and increase in number, they affect the patient in a number of ways. Myeloma cells interfere with the body’s ability to build bone and instead cause bones to weaken and break down – especially those in the spine, ribs, skull, and pelvis. Eventually, myeloma cells permeate the interior of the bone (the medullary cavity) and also erode the outer layer of the bone (the cortex). Minor stresses and injuries are more likely to fracture weakened bones; these are called pathologic fractures. This creates an additional stress/condition for the patient: a mechanical weakness which sometimes also needs to be treated directly through traditional therapies (surgery, etc.). In addition, as bones break down, calcium is released into the bloodstream, often leading to a condition called hypercalcemia, which can cause pain, nausea, vomiting, altered mental states, depression, headache, and, in severe cases, coma. In a condition sometimes called “myeloma kidney”, high levels of calcium and/or protein in the blood can interfere with the way kidneys function and diminish their ability to filter the blood properly. Over time, this can lead to permanent kidney damage and, ultimately, kidney failure. 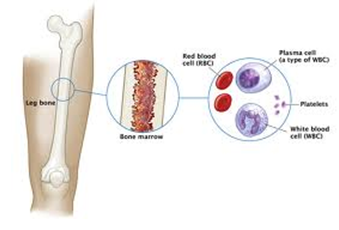 As myeloma cells take over the marrow space, they prevent bone marrow from producing essential blood cells, including red and other white blood cells. Patients with multiple myeloma are therefore prone to anemia, which is caused by low levels of red (oxygen-carrying) blood cells, and to infections because of the lack of white (infection-fighting) blood cells. An antibody is a protein produced by the immune system to defend the body against foreign agents, and particularly bacteria. Antibodies are secreted by cells called plasma cells, which are derived from another type of immune cell called a B lymphocyte or B cell (white blood cells). Antibodies are large glycoproteins (proteins with attached sugars) called immunoglobulins. They consist of two identical heavy chains and two identical light chains, joined by interchain bridges (see diagram below). Each light chain is composed of a variable third and a constant two thirds. There are two families of light chain (kappa and lambda), which differ in the characteristics of their constant portion. Heavy chains are composed of a variable fragment and three or four constant domains that define five families or classes of Ig: IgG, IgA, IgM, IgD and IgE. The two light chains and the two heavy chains of the same Ig molecule are always identical. 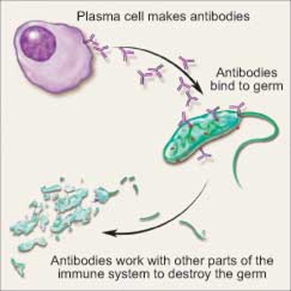 A given B lymphocyte and the resulting plasma cell produce and secrete only one type of antibody. Each antibody has a characteristic binding site through which it binds to its target, i.e. the antigen that it recognizes. 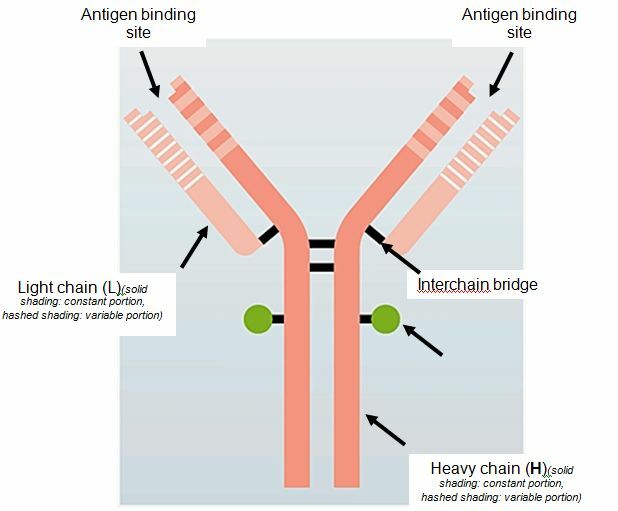 Each Ig has two identical antigen binding sites, formed by the combination of the variable portion of one heavy chain and of one light chain (see diagram below). Diagrammatic representation of the structure of an immunoglobulin (Ig) molecule. Monoclonal gammopathies are defined by the presence of a monoclonal immunoglobulin (Ig) in serum or urine. This situation indicates the presence of a group of immune cells, termed a clone, that all produce the same Ig molecule. The clone may consist of malignant cells, which damage their environment. In these cases the monoclonal gammopathy results from malignant proliferation. The main ones are myeloma and Waldenström’s macroglobulinaemia. In many cases, the cells of the clone are not aggressive: these « benign » proliferative disorders are actually intermediate situations and can progress to overt malignant disease. They are termed monoclonal gammopathies of undetermined significance (or “MGUS”). Multiple myeloma can start out as a relatively benign condition called monoclonal gammopathy of undetermined significance (MGUS). In the United States, about 3% of people older than age 50 have MGUS. This number increases with age(up to nearly 10% of people over 90 years old could have MGUS). Each year, about 1% of people with MGUS see their condition turn and start developing multiple myeloma or a related cancer. MGUS, like multiple myeloma, is marked by the presence of M proteins – produced by abnormal plasma cells – in your blood. However, in MGUS, no damage to the body occurs. At least 30–50% of malignant multiple myeloma seems to arise from the benign plasma-cell neoplasm monoclonal gammopathy of undetermined significance (MGUS). Researchers are studying the DNA of plasma cells to try to understand what changes occur that cause these cells to become malignant (cancer cells). Though they haven’t yet discovered the cause of these changes, they have found that almost all people with multiple myeloma have genetic abnormalities in their plasma cells that probably contributed to the cancer. An abnormality in which part or all of chromosome 13 is missing.